The DX Drainback has been designed to be a complete solar appliance that incorporates ease of installation and maximum efficiency for years of trouble-free service. The DX Drainback system uses the sun’s energy to heat your water, reducing your electricity consumption. The DX Drainback will pay for itself many times over the life of the system. All installations require a connection to your home water system. The system can be installed as a stand-alone system or as a preheat interface to an existing gas/electric water heating system. Only a qualified installer as regulated by the authority having jurisdiction should do the installation. If you have questions on the proper methods to make these connections, consult a qualified plumber or solar contractor for prescribed methods in your area. 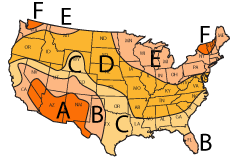 In most cases your installing solar contractor is familiar with the codes and their application. The codes are intended to protect the health, safety, and welfare of the public. The component that makes the DX Drainback system unique is the drainback reservoir with built-in heat exchanger. 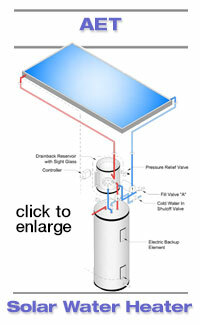 This allows the use of a lightweight glass-lined storage tank. The system collects heat by circulating water between the reservoir and collectors and simultaneously, between the storage tank and the heat exchanger inside the reservoir. Since only thermally efficient pure water is used, maximum safety and performance is assured. The DX Drainback system is ideally suited to cold regions with many freezing days each year or areas with aggressive water conditions. Freeze protection is provided by draining the collector loop liquid back into the drainback reservoir when the system is not operating. The simplicity of the drainback method provides reliable operation that makes this system an asset to any home located in the colder climes. 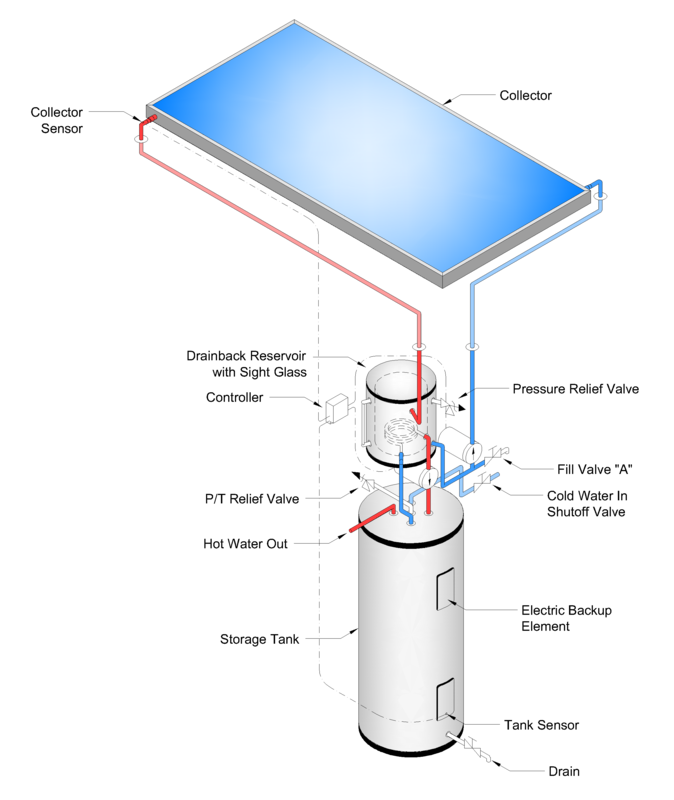 Your DX Drainback system consists of a collector array, a drainback reservoir that incorporates a heat exchanger, a storage tank, two pumps and a system controller, pre-engineered system. Is this the right size system for me? for your family size and location here.